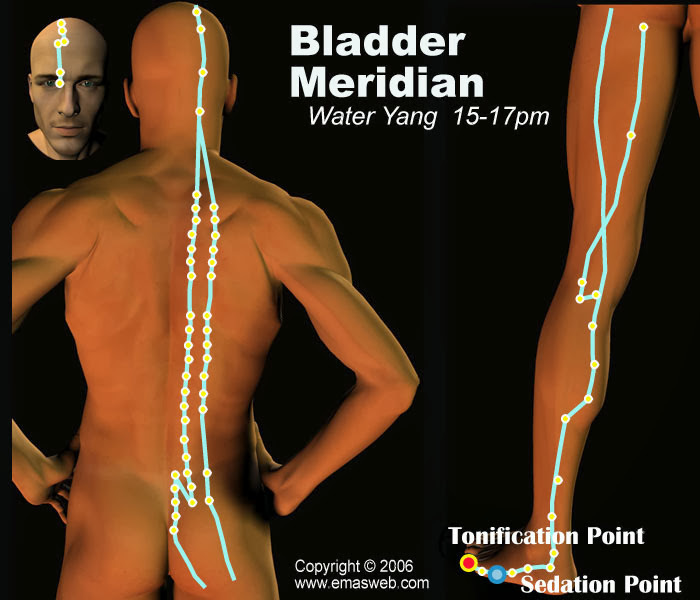 The Urinary Bladder Meridian connects with the Kidney Meridian, with which it is externally-internally related. Abnormalities of the Urinary Bladder Channel cause diseases of urinary tract. Its abnormalities tend to produce different symptoms in many parts of the body, such as difficult urination, enuresis, pain in the eyes, runny nose, epistaxis, etc. In addition, headache, neck pain, back pain, lumbar pain, sciatica and so on, are frequently due to the Urinary Bladder Meridian. Besides this, the pathway of the Urinary Bladder Meridian meets the spinal nerves of the various organs. So abnormalities of the organs may be reflected onto the Urinary Bladder Meridian. Use differential diagnosis to determine the abnormal conditions of other channels and collaterals. Besides the Urinary Bladder, the Urinary Bladder Meridian includes the renal tubules and ureter. Peak qi and blood flow in the Urinary Bladder Meridian is from 3:00 pm to 5:00 pm. 1.Diseases of the uro-genital system. 5.Diseases of the digestive system. 7.Diseases along the course of the Urinary Bladder Meridian.